Organizer John Battelle, thinks of this two-day event to be part art opening, part music festival — like a field trip in a city. Battelle had been organizing “industry events” for lots of years, until one day he just got tired of the rent-a-banquet-room-listen-to-speakers treadmill. He enjoyed the moments between stages at music festivals like Coachella or Lollapalooza and wanted to find a way to get that dynamic operating in the start-up movement. 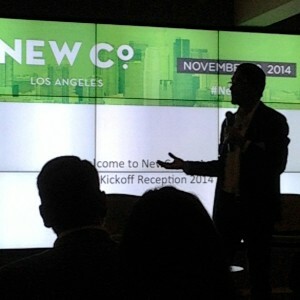 In 2014 New Co. events have popped up in Silicon Valley, Amsterdam, New York, the United Kingdom, Detroit, Boulder Colorado and San Francisco. Los Angeles is his eighth. 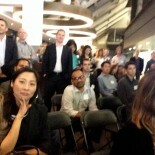 The first night of the event, was held at the offices of CBRE‘s Downtown Los Angeles Commercial Real Estate offices. Jason Nazar, Founder Docstoc and Start-Ups Uncensored sponsored my VIP tickets to this brilliant event and “Fireside Chat” between John Battelle and Ze Frank, President of Buzz Feed Motion Pictures. Shannon is an enthusiastic presenter who knows social media. She presented at General Assembly in Santa Monica. 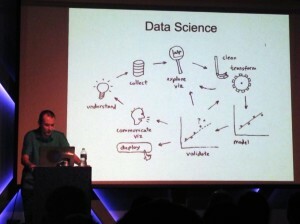 In an attempt to broaden my horizons, I went to a meet up on Data Science. I figured, I could hang, I took statistics one summer at UCLA, I paid attention in math class. 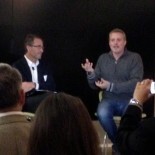 The two speakers at Cross Campus, a shared office for teck start-ups in Santa Monica, presented cogent words on this burgeoning science. Szilard Pafka shared ten pit falls on data science. He admitted there were many more, but he only had 30 minuets to give his talk. He presented a graph that outlines the “science”. “This is my only slide” he admitted. It out lined the circular elements that make up the field: Understand, collect, explore, clean, model, validate, communicate and understand. It is a circle after all. “The point” Pafka said “is to extract business value from data; Collect more money or create actionable information; Do ‘B’ instead of ‘A'”. Pafka warned about coming up with ideas, procedures or goals that were so complex, they could never be implemented. “Art” could be substituted for science, but with all those numbers and statistics and upper management wondering why you are employed, “science” is better for the ego, until your work saves the company $100 mill; again.